The 2016 Muscatine Municipal junior golf program has been designed to make each session fun and competitive. Each student will receive points throughout the program for attendance and various skills challenges throughout the program. Students will also receive 5 points each time they play a round on the golf course on Saturday or Sunday afternoons after 4:00pm so remember to check in at the golf shop counter to get your points for that day. Day 1: Putting. Instruction on proper set up, ball position, grip, alignment and etiquette while on the green. The proper way to mark your ball and the proper way to fix your ball mark. Towards the end of the session there will be time allotted for a couple of putting challenges where points will be awarded to each student. Day 2: Chipping. Instruction on proper set up, ball position, stance, grip, alignment and proper club choice for each type of chip. Towards the end of the session there will be time allotted for a couple of chipping challenges where points will be awarded to each student. Clubs needed: Sand Wedge or Pitching Wedge, 8 Iron, Putter. Day 3: Short Irons. Instruction on the proper stance, set up, ball position, grip, posture and alignment. This is the first time we get into the full swing, so we will also concentrate on the proper swing mechanics that the full swing is comprised of. Towards the end of the session there will be time allotted for a couple of short iron challenges where points will be awarded to each student. Clubs needed: Sand Wedge, Pitching Wedge, 9 Iron. Day 4: Mid Irons. Instruction on the proper stance, set up, ball position, grip, posture and alignment. We will also concentrate on the proper swing mechanics that the full swing is comprised of. Towards the end of the session there will be time allotted for a couple of mid iron challenges where points will be awarded to each student. Clubs needed: 8 Iron, 7 Iron, 6 Iron. Day 5: Driver/Hybrids. Instruction on the proper stance, set up, ball position, grip, posture, correct teeing height and alignment. We will also concentrate on the proper swing mechanics that the full swing is comprised of. Towards the end of the session there will be time allotted for a couple of driving challenges where points will be awarded to each student. Clubs Needed: One Hybrid, Driver. Day 6: On course Etiquette and Basic Rules/Review. We will go out on to the golf course and go over certain scenarios that can occur during a round of golf. We will also go over the basic rules of the game and the correct way to act while on the golf course. We will also review everything we learned and answer any questions. Point totals will be calculated and prizes handed out. 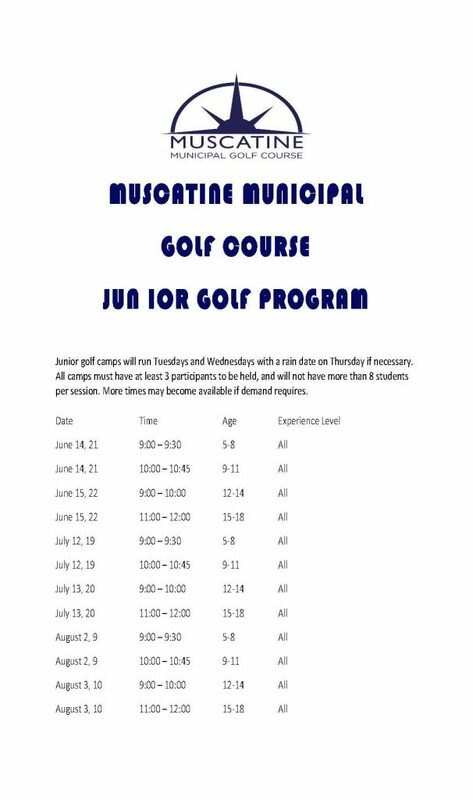 The fee for the Junior Golf Program is $40.00 per child. To sign your child/children up for the program, please call the golf course directly at 563.263.4735. The registration deadline is one week prior to the first session. Each age division requires a minimum of 3 participants to be held.